Origin and Habitat: SE Asia: New Guinea, endemic to the Mamberamo River system. Inhabits flowing streams (main river tributaries) and swamps and marshes; found among thick vegetation, bogwood and submerged branches and roots. Compatibility/Temperament: Peaceful. Must be kept in a group of 6 or more to ease its skittishness, with a ratio of minimum 2 females per male to prevent over-harassment. Tankmates can include any of the peaceful and similarly-sized rainbowfish, characins, rasbora, danio, dwarf cichlids, catfish and loaches. Naturally feed on insects, small aquatic crustaceans, insect larvae, worms, phytoplankton, zooplankton and some aquatic plant material. In captivity, accept a range of prepared foods, which should include frozen and live if available to improve colouration. 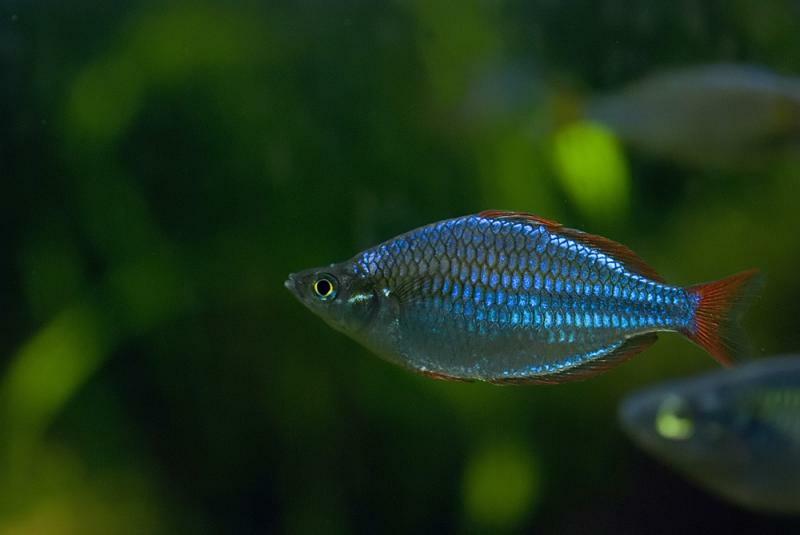 Dwarf neon rainbowfish are not fussy eaters but be sure to feed them food that is not too large. They may have large mouths but their throats are rather narrow to allow large food bits to be swallowed. Around 2 inches; some sources mention 3 inches but usually smaller than this in aquaria. 24 inches but preferably 30 inches and up. Soft to medium hard (5-15 dGH); for wild-caught fish, slightly acidic (pH 6-7), tank-raised slightly acidic to slightly basic (pH 6.5-7.5). Temperature 22-28C/72-82F, long-term maintenance is best at 24-25C/74-77F, higher for breeding. Like all rainbowfish, clean and stable water is important tyo prevent poor health and disease. The aquarium should be well planted along the sides and back wall with open swimming space in front and a moderate flow from the filter; regular partial water changes of 50% weekly are advised. This fish has an average lifespan of 4 years. Sexual dimorphism is easy. Males have red edges on their fins whereas females have yellow or orange fins although in the wild, most females appear to have red fins. Buy more females than males when attempting to keep a group. Like the livebearers, males are often too overzealous in their attempts to impress the females. This species was described in 1922 by M. Weber and L.F. de Beaufort who placed it in the genus Rhombatractus. In 1991, G.R. Allen moved it into the current genus Melanotaenia that had been erected by Gill in 1882; the name comes from the Greek melan, -anos [= black] and Latin taenia [=stripe], referring to the usual vertical stripe pattern which happens to be absent on the subject species. Allen, G.R. (1991), Field guide to the freshwater fishes of New Guinea, Publication No. 9 of the Christensen Research Institute, Madang, Papua New Guinea.